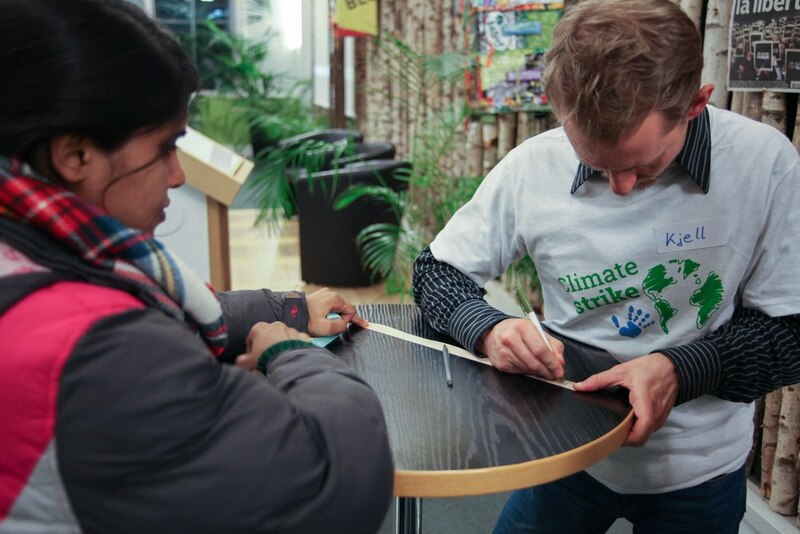 After being inspired by a Climate Ribbon ribbon event in Christmas 2016, a group of climate activists in the Netherlands held a Climate Ribbon ceremony at the Dutch Parliament building on March 2. They did so in anticipation of upcoming elections on March 15, after many brainstorming sessions about how to influence people to include climate change and climate justice in their votes. They teamed up with the Grootouders voor het Klimaat (Grandparents for Climate), who are there every 1st and 3rd Thursday, and mobilized their grandchildren to participate in the ceremony. They saw this action as a dress rehearsal for a bigger one following the elections, with the aim of influencing politicians on their responsibility in preventing climate change through sound and active policy. They even created a Dutch version of our Climate Ribbon website! It’s at klimaatlintjes.nl (ribbon = lintje, climate = klimaat). It's a simple version of our site, including their own mission and statements, in which people can enter their ribbon texts and read about the how, why and what of the ceremony. 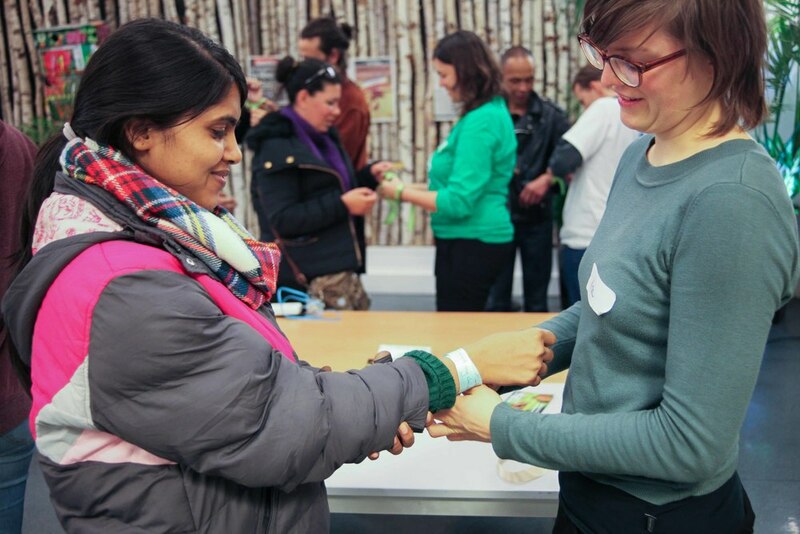 We are very excited to welcome our Dutch friends to the beauty and power of the Climate Ribbon! We have all returned from Paris and the whirlwind of the holidays. We want to take a moment to thank all of our volunteers, supporters, design team, and media team for the amazing work and brilliance that went into making the project a success and share the story of the trees. The end result! A stunning display with thousands of ribbons. There were ultimately 3 trees built. The giant one was about 13 feet high and 20 feet wide. The two smaller ones were 8' high and used one of our design team member's, John Swain, hanging hoop design. 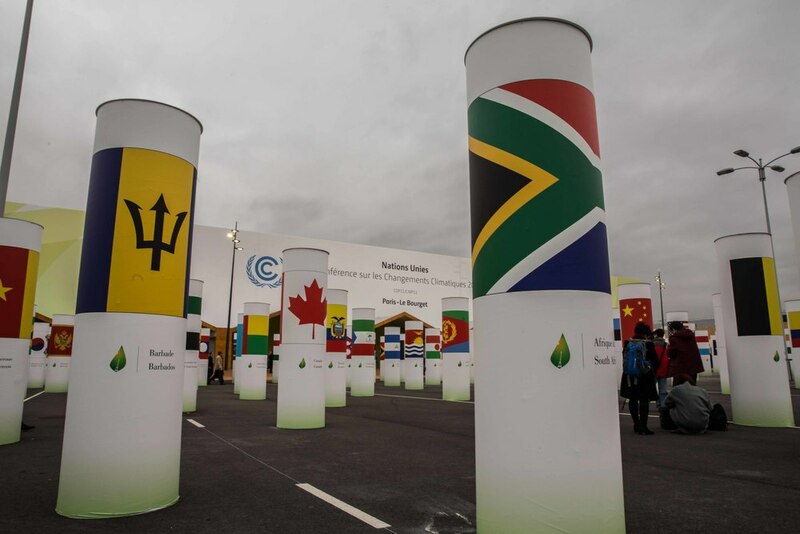 One of which was "planted" in L'Bourget, "Inside" COP21 where the NGOs and politicians met. The large tree, which we named "The Tree of Solidarity" was installed twice. First at a giant 2-day festival called "The Village Mondial des Alternatives" put on by the Coaltion Climat 21 and Alternatiba, where thousands of people (including lots of families) participated in writing and hanging ribbons. The second spot was for 5 days at the "104 Space" a massive arts epicenter that was the primary organizing launchpad for the final actions on December 12th. It looked amazing in both settings. People intently writing and tying ribbons. Members of our design team was gracious enough to keep adjusting the 3D model on Paris time (THANKS Mateo! ), based upon refinements we were making with the folks there on the ground. Here you can see us start to slot the pieces together! The tree was cut out of Poplar, a locally grown sustainable farms in France. It is soft wood and water resistant. It's going to have a long life (see the Epilogue, below). Above is the cool artists workshop that we were able to construct it all in. This is how we laid out the pieces before we installed it in 104 space. By the end of our stay (and with some modifications) we were able to assemble the large tree from start to finish in less than 1.5 hours. Pretty fast for something so big and complicated. Interior "keystone" space capturing a cathedral-like quality. Engraving of the central question that the Climate Ribbon Project poses. Placed in both French and English on the front and back steps. But in the end, despite the many challenges we faced, it was a great success and the tree's design and aesthetics were a huge part of that. The trees are finding new homes. One of the small trees will be with a group "Foresters without Borders" who are planting hundreds of thousands of trees across France and the other remained with our team in Les Lilas as they host ribbon events in 2016. The large tree was taken to Southern France where a Utopian community has adopted it. Mind you, this is not-your-father's-hippy-dropout-commune. This is a high functioning village with 300 residents, many of whom are expert builders and craftsmen. They are going to retrofit and weatherproof the tree for permanent installation at the very center of their village. It is being unveiled early this Spring. There will be more from the Climate Ribbon team soon, including a full Paris debrief with videos. And if you are in NYC this weekend, please join members of the Climate Ribbon team at the COP 21 Report back at the Mayday Space. 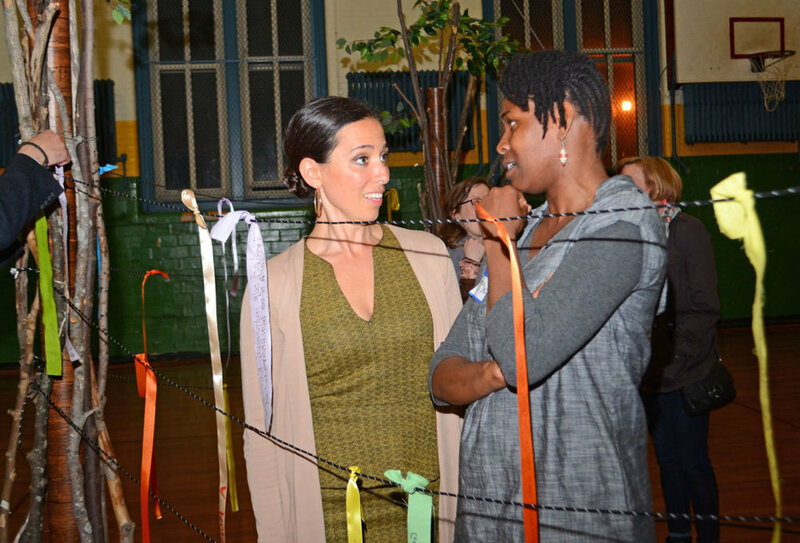 The Climate Ribbon has been very busy! Photos by Kate McNeely, LJ Amsterdam, Michael Premo, Rachel Falcone and Walter Hergt. In the wake of the recent attacks and the ensuing police repression, activists are connecting the dots between climate change and violence, transforming France's declared state of emergency into a global state of climate urgency. And the Climate Ribbon is playing its part. On Saturday, November 28, at the 6000-strong Conference of Youth, Carl, 14, a young activist from Syria currently living in Orleans, France, contributed a climate ribbon that highlighted the deep connection between conflict and climate chaos. What Carl loves and is afraid of losing is his home country, REMOVE: because of "all the pollution of the bombs that fall in Syria." For many families in Syria, he explained, the risk comes with every breath: "Syria is a very hot country and it’s cold in the winter… with the bombs there is no electricity and with the pollution the people can't breathe." Carl used his ribbon to make his struggle visible. He told us, "nobody has really written about Syria and maybe in COP they [the UN] will see this and think about Syria too." On Sunday, November 29, even though the mass climate march was called off by French authorities, thousands of people gathered together and locked arms, forming a two-kilometer human chain that "broke" in front of the Bataclan concert hall where 90 people were killed in the November 13 attacks. Lots of folks gathered in La Place de la Republique, and around the various sites of attacks. Human Chain participants were both reverent and playful—with improvised costumes and impromptu dancing in intersections. 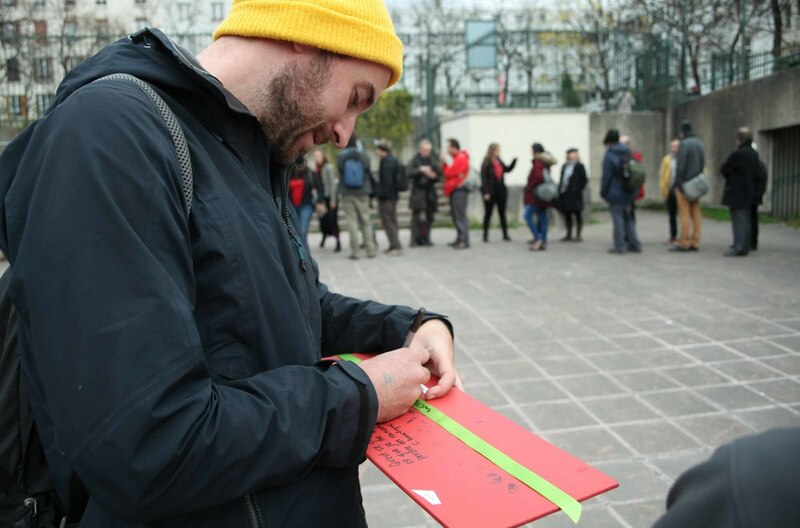 Bi-lingual Climate Ribbon volunteers were out on the streets too, inviting participants to contribute what they love and hope to never lose to climate chaos and add them to Climate Ribbon trees installed across Paris. Today was the first day of the climate summit. 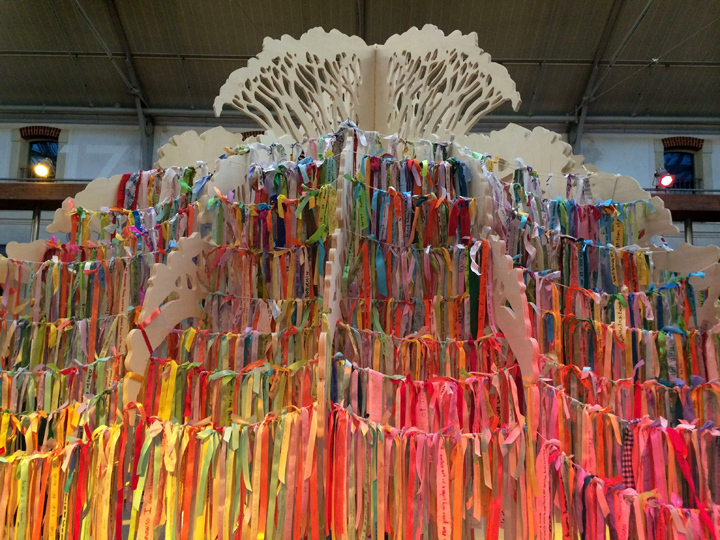 With one ribbon tree debuting inside the UN conference at Le Bourget tomorrow, and one installation hung at 'A Place 2 B,' the activist co-working hub set up for the COP21, the Climate Ribbon crew is throwing down on our biggest installation yet. 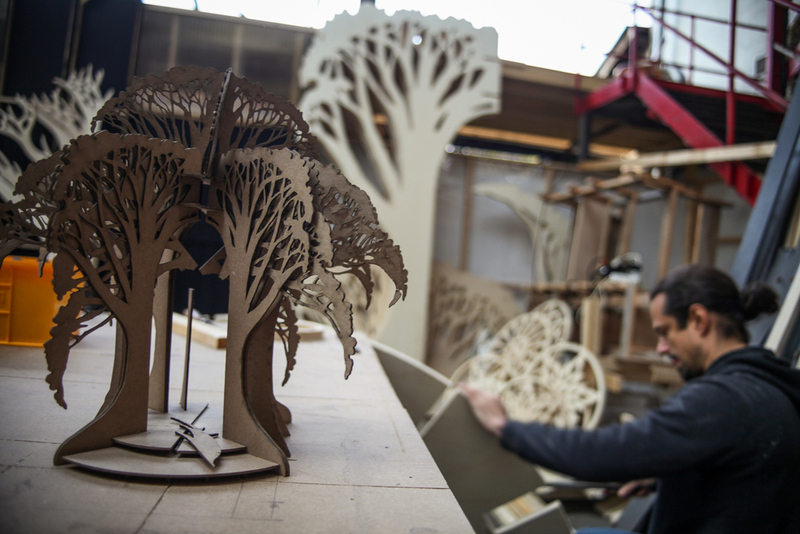 The Tree of Life is currently being constructed in an artists' warehouse in a working class neighborhood of Paris, in collaboration with a talented team of local designers, builders and artists. We've exhausted our funds, but we’re continuing to work full steam ahead. Please help us cover all the costs of this project. Make an online donation now. With your help we can bring this healing ritual and heart-opening work of art and to the people of Paris and the world. Ribbon Tree: What is your red line? Global Action on D12. We all have things we are not willing to compromise on; we all have things we love too dearly to let be lost to climate chaos. What is your red line? What do you love and hope to never lose to Climate Chaos? On December 12, as the COP21 is concluding, citizens around the world are laying down the 'red lines' that negotiators must not cross. Find the action nearest you. Or host your own. Bring red ribbons or strips of red fabric and invite people to write their responses down and share by tying them on a tree or fence beside the action. Invite people to read aloud what others have written. 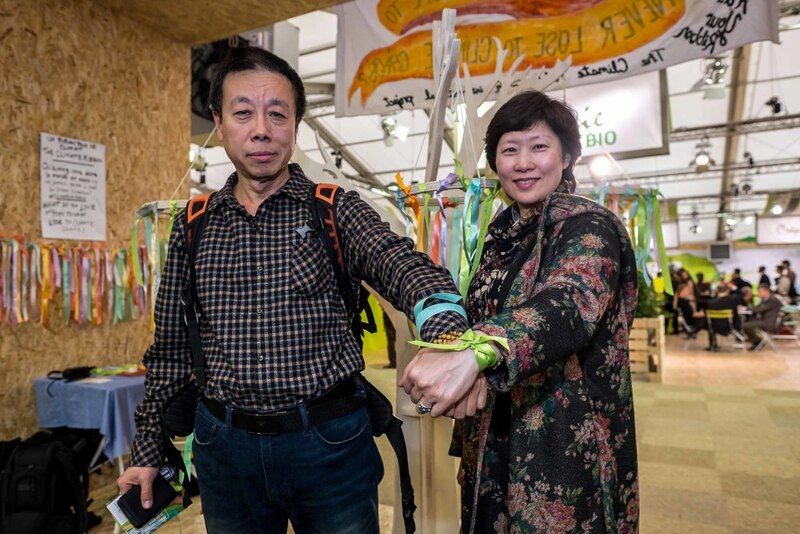 People can also tie the ribbons around their wrist as a reminder of their commitment to organize for climate justice. 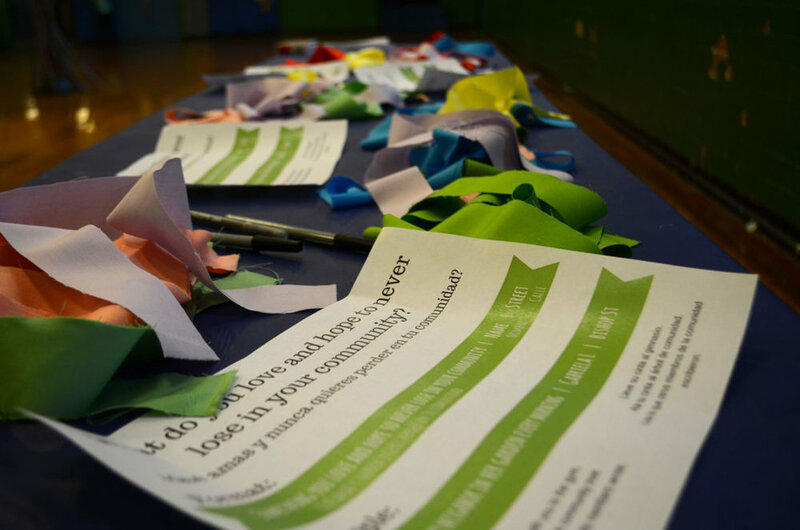 Invite press, and invite kids - they often have the best sense of how big this crisis is and the details we risk losing. Be sure to upload your photos to TheClimateRibbon.org.